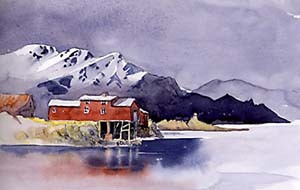 In May 2005 we took a group of painters to the Lofoten Islands in the north of Norway. 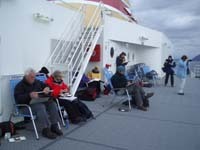 The islands are north of the Arctic circle and therefore at that time of year we were blessed with 24 hour daylight. It was quite difficult to get used to the fact you could sketch round the clock and we found it hard to decide when it was bedtime. 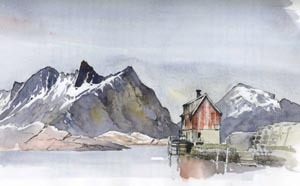 We began our trip with a cruise on the MS Finnmarken from Tromso to Stamsund and painting subjects came along so thick and fast we could not sketch fast enough. 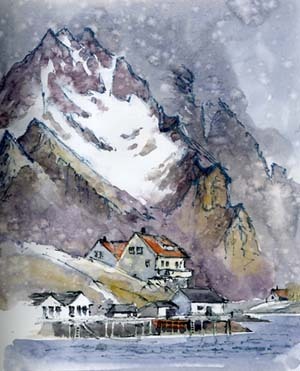 When we reached Lofoten we stayed in Fishermen’s Rorbus. 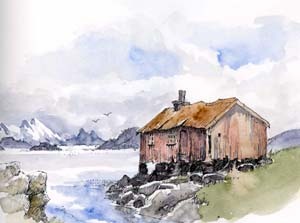 (huts) like the one on the left. 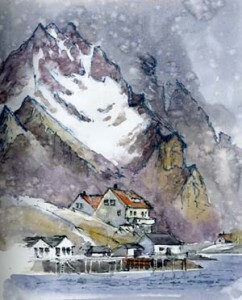 The light was clear much of the time and with the snow still on the mountains, the sea crystal clear and the attractive buildings we were spoilt for subjects.